Over the past decade, open world sandbox games have proliferated. Modern technology allows for bigger experiences with a lot less seams. Generally speaking, this is a good thing. Great open world games allow the player to become completely immersed in its plot and setting. The Witcher III is an absolute masterpiece of open world design. You are given a world that begs to be explored, and it is a joy to do so. Players carve out their own path, but not at the expense of the story that CD Projeckt Red want to tell. The problem is that some game designers mistake having a lot of things to do for having a lot of player choice. Pictured: Chaos and confusion, slowly turning to apathy. To be fair, some of those side quests can be pretty good, but most are the video game equivalent of busy work. The Far Cry series is even worse in this regard. They are beautiful, fun to play games, but nothing about the environments you play in are memorable. They are big maps filled with tons of things to collect and kill. Ubisoft is an easy target, but other devs are just as guilty. Metal Gear Solid V is generally a successful open world game that gives you a lot of freedom on how you want to complete your missions. However, the side ops are a symptom of the Disease of More. After a few hours, it becomes apparent that you are doing one of a handful of mission types over and over again. Unless there was something useful on the other side, or a rad animal to add to my zoo, I started to skip them. To be fair, developers could be responding to consumers that have been burned one too many times by The Order: 1886's of the world. Unfortunately, there seems to be a strange binary that your game either needs to be completely open world or corridor shooter. Thankfully, it doesn’t have to be this way. 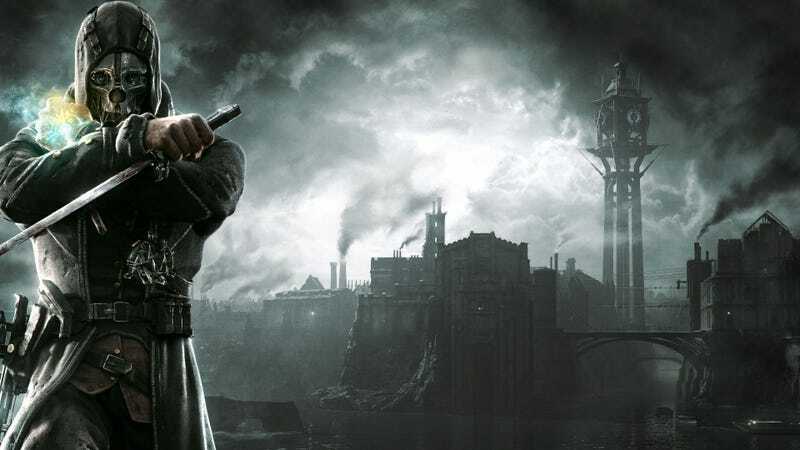 There are quite a few linear games that are open ended in their design, but the best modern example is Dishonored. There isn’t an open world to explore and you are taken to almost all of the targets by boat. The levels are big, but your goal is pretty open and shut. There is a target, and you have to deal with them. Dishonored uses these self imposed shortcomings to its advantage. Instead of populating the game with repetitive “content”, they empower you through the abilities of hyper competent assassin Corvo Attano. Corvo “only” has six active powers, but they all fit together with each other, unlockable passives, the environment, and the traditional weapons at your disposal. It isn’t possible to max all of the powers or skills in a single playthrough, promoting the player to replay it after the credits roll and try different techniques. The levels all begin and in at the same place, but there are multiple routes to get to your target. It is perfectly valid to use your Blink ability to pop to a vent behind a guard, quickly take over the body of a nearby rat and infiltrate through there. Once inside, you can use your ability to see enemies and important objects through walls to avoid detection, disable the security system, and zero in on your prey. The stages have a ton of verticality to take advantage of. If you come across a seemingly impassable guard post, take a moment to look up. It is possible to skip through massive sections with some creative routing, allowing you to avoid most guards altogether. Or, you can kill them all. It is possible to play the entire game without killing a soul, but the game really shows its twisted chops when you become a whirling dervish of death and destruction. A few examples: The game features traps that unleash slicing barbed wire to gruesome effect. You can place them around the level simply enough, but you can also attach the trap to a rat, possess it, and then send it over to a couple of chatting guards. Getting shot at? Slow down time, possess an enemy to walk in front of enemy gunfire. While time warp is still active, you can quickly dispatch the rest of the gunmen with your blade or you can summon a swarm of rats to devour them while you make your escape. Feeling especially cruel? Possess an enemy, walk them up to the edge of a building, jump out of their body, and push them off using your Wind Gust ability. Speaking of Wind Gust, it is handy to deal with enemies firing explosives at you by pushing them right back at them. The great thing about Dishonored is that you don’t need to be nearly as good as StealthGamerBR or TheWalrusMovement to have a good time, but that level of depth is there for those that want to explore. Not every linear game should be exactly like Dishonored, of course. Indeed, it is possible to develop a really good, hyper linear game. But being able to let players actually play instead of being shuttled from one scripted sequence to the next is a target that devs should be aiming at.